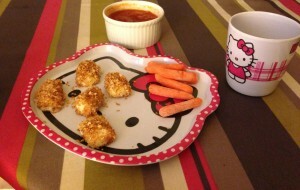 Here is an easy and tasty snack or lunch for your little one! Charlotte loves cheese sticks so I figured these mozzarella bites would be a hit. To prep, simply cut up a piece of string cheese, dip into egg or egg substitute, and dredge in some toasted panko. Then bake for just two minutes to soften the cheese (the recipe calls for three minutes but a few pieces melted too much). Serve with some marinara for dipping. What kid doesn’t like to dip?! Everyone in the house loved them! Tim and I gobbled up some leftover pieces and Angus ate one that hit the floor. Heat a medium skillet over medium heat. Add 1/3 cup panko to pan, and cook for 2 minutes or until toasted, stirring frequently. Remove from heat, and place the panko in a shallow dish. Cut mozzarella sticks into 1-inch pieces. Working with one piece at a time, dip cheese in egg substitute; dredge in panko. Place cheese on a baking sheet coated with cooking spray. Bake at 425° for 3 minutes or until the cheese is softened and thoroughly heated. Pour the marinara sauce into a microwave-safe bowl. Microwave at HIGH 1 minute or until thoroughly heated, stirring after 30 seconds. Serve with mozzarella pieces. My friend Amy bought me the Weelicious cookbook for my birthday. The recipes are family-friendly, healthy, and relatively easy to make. Other than hot dogs, Charlotte is not much of a meat eater. But I keep trying new things in the hope that I find a dish or two featuring meat that she’ll enjoy. 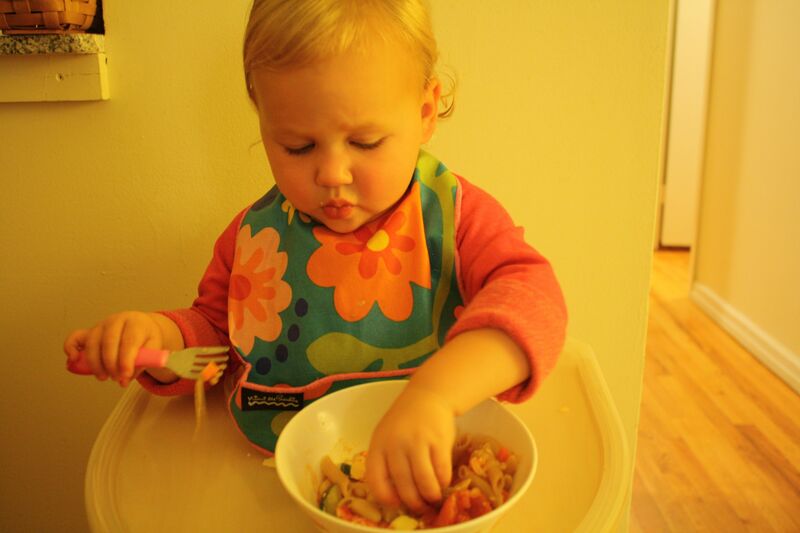 The Weelicious cookbook is proving to be a good source for some recipes Charlotte will enjoy. These turkey meatballs looked so simple but tasty! The addition of pesto looked interesting and added a nice flavor. Charlotte and I both enjoyed them! She did not devour them but eating one meatball was a win! One note: I had to cook the meatballs for about 10 minutes longer than the recipe called for. Place the turkey, pesto, bread crumbs, cheese, and salt in a large bowl and combine thoroughly. Pour the tomato sauce into a 9×9 baking pan. 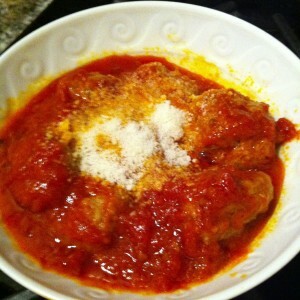 Use about 1 tablespoon per meatball, roll the mixture into balls and place in baking pan. Cover the baking dish with foil and bake for 25 minutes, or until cooked through. 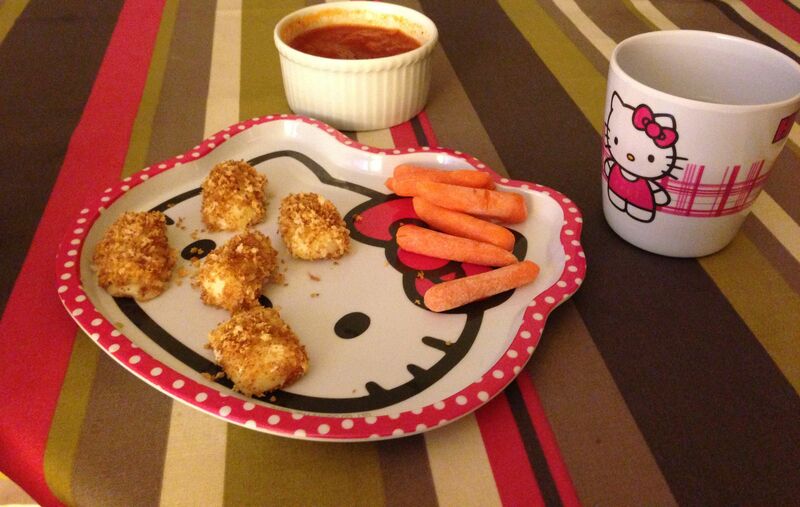 As I’ve mentioned before Charlotte is a good eater but seems to gravitate towards vegetarian options. She’ll eat fish and occasionally chicken. But she loves cheese, beans, hummus, avocado, tofu. Here is a tasty pasta dish I made for Charlotte. It is packed with veggies and has some protein from the white beans. I also used a whole wheat penne to make the dish even healthier. You can make this recipe for all the whole family — I had leftovers for lunch topped with grated parmesan. Yum! Cook pasta according to package instructions; drain. Set aside. In medium nonstick skillet, heat oil over medium-high heat. Add onion and carrots, and cook, stirring occasionally, until they begin to soften, 3 to 4 minutes. Add sage, oregano, salt, pepper, and stock. Reduce heat to medium, and simmer 10 minutes. Add zucchini and tomatoes; cook, stirring occasionally, until carrots are tender, 7 to 8 minutes. Add the beans, and cook, stirring occasionally, 3 minutes more. Remove from heat. Toss with pasta, and serve. Since it’s the start of the school year, I thought I should post some kid-friendly recipes that will also appeal to adults. Tonight I made Tim this wonderfully simple but delicious chicken cutlet recipe served over greens with a lemony vinaigrette. Just a couple of comments…I didn’t have seasoned breadcrumbs so I just added some Italian seasoning to the breadcrumbs. I also ran out of butter so I just used 2 tablespoons of olive oil. Make sure not to crowd the cutlets when cooking them. Cook them in batches if you need to. Lastly, I added some cucumbers and tomatoes to the salad. The cutlets were very tasty and went perfectly with the greens. This will definitely satisfy both kids and adults!